If you are reading this review please make sure you read the reviews on Browzine, Read, and Docphin to make an informed decision as these products are all very similar to Docwise. 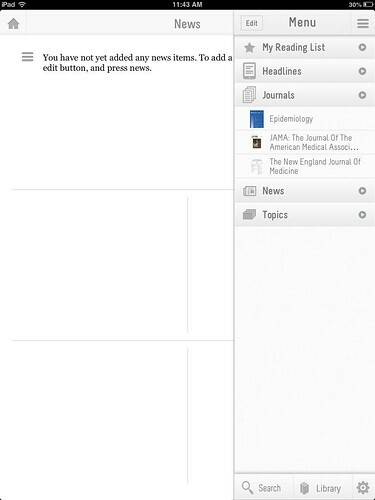 These apps help users view and read journals on the iPad. Docwise is another such app and the review below by Joey Nicholson is the last of the apps to be reviewed in genre. I want to thank Joey for his very thorough review. Hopefully after reading over the four reviews you will learn about each of the products and have the information to choose a product. 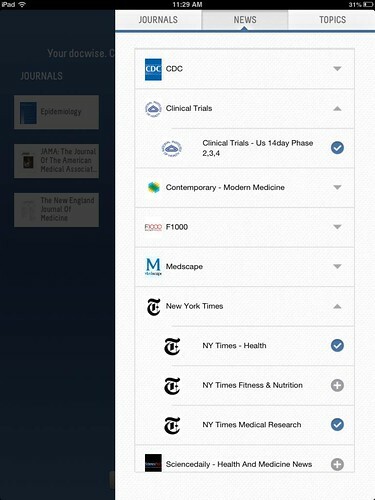 Docwise comes from new contenders in the medical journal app market. It is co-founded by two MIT alums, who both went on to pursue further education in healthcare (one is a practicing surgeon). They bill it as “a personalized e-journal for physicians” and as “the efficient way to stay up to date on all your medical news”. Currently, this app is only available for the iPad. 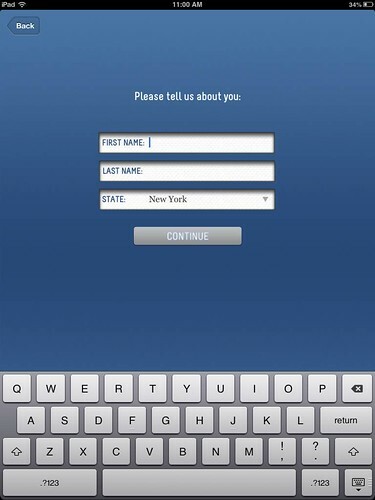 Once you download the app, you need to register for an account by adding your personal information. 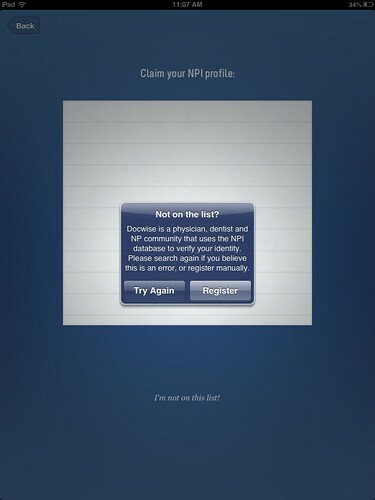 Since it is designed as a “physician, dentist and NP community”, the app will link to your National Provider Identifier (NPI) profile so that it can create a beginning journal collection tailored to your speciality. 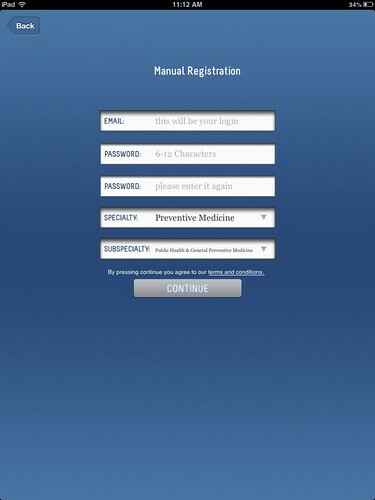 For those of us that aren’t physicians, we can still get in by using the manual registration option. In the manual registration, you are asked to provide your specialty and subspecialty. 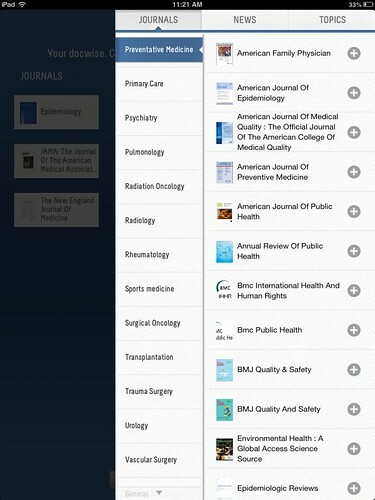 These items are required so that the initial journal collections you are shown are tailored to what you do and your interests. Theoretically, this should take some of the effort out of pulling together all those journals that someone may want to read by already having them grouped by topic. I selected preventive medicine and public health to start. Once you’ve indicated your speciality, the next screen presents your starter collection. For public health, the collection isn’t very large and should probably be expanded to include something like the American Journal of Public Health as a core title. But, the three titles that come up are relevant. From here you can tailor what it is you want to see in docwise. They have this broken down into three categories. 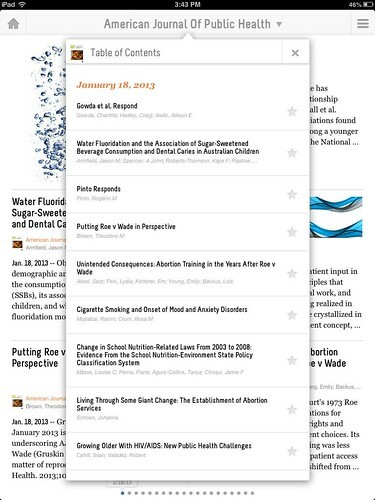 You can add specific journals, you can add news feeds, or you can add topic areas. Adding new journals to your personal collection is very easy, assuming you know in what category the journal of your choice is placed. Under Preventive Medicine, you can quickly hit the plus signs to add AJPH, BMC Public Health, and several other relevant journals. 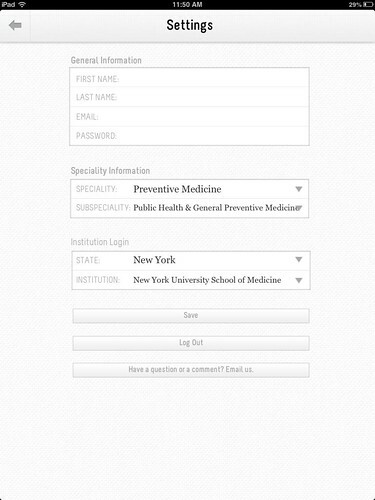 A search box here would be nice, I couldn’t find Academic Medicine under any of the journal specialty categories. A feature that I really like is the ability to add news stories to this, not just academic journals. There is a decent selection of top health-related news sources, including New York Times Health, Fitness, and Medical Research, and feeds from ClinicalTrials.gov and the CDC. Next you can enter topics in which you are interested. 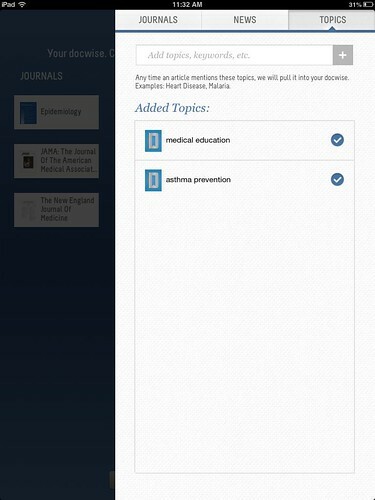 By using key words that you put in, docwise will create a topic feed and pull in articles from any journal on these terms. What isn’t clear about this from a librarian perspective, is where these key words are being searched. Title? Abstract? Full text? MeSH terms? 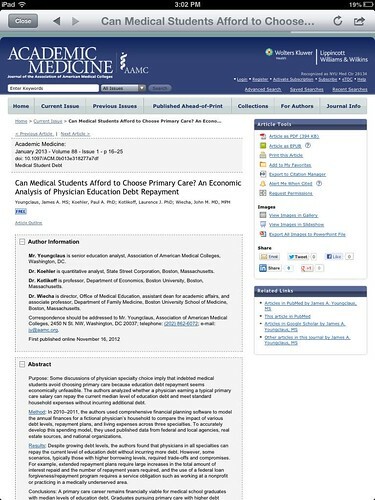 PubMed? GoogleScholar? 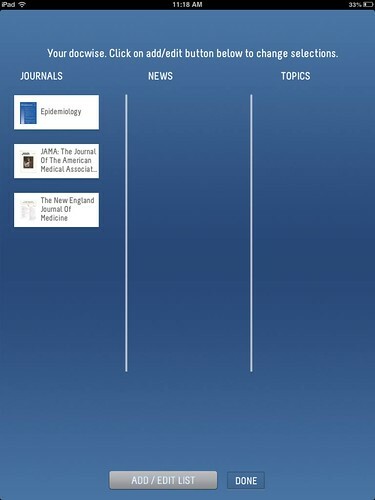 Once you are done adding journals, news, and topics you swipe that menu away and click done. While you can start reading abstracts and free articles that you happen upon right away, the next logical step is to add your institutional login information. To do this, you have to hit the Menu icon in the top right and then hit the gear icon in the bottom right to access your settings. Currently not all institutions are available in the institution login drop-down menus. While it doesn’t say this outright, I assume that you can use the link to email them and they would add your institution. Fortunately for me, one of the developers is a surgeon at my institution, so we are already in there. Once you’ve set up your institution, you can start reading your articles. In my case, I am routed to my library’s remote access login web page when I try to read a full article. I enter my user name and password and am taken directly to the article. Since this service is based on how the library sets up their remote access, this will vary depending on the institution. After I enter my login information once, it does retain it for a while. I can continue to read articles without having to enter my login information again. But, if I put it down for a while or come back to it another day then I had to enter it again. The home screen default displays headlines from a variety of your selected resources. The layout looks much like Flipboard or Read by QxMD. When you click on an article title/abstract of interest, you are taken to see the full abstract in a built-in web browser. One downside of this is that you must be connected to WiFi or 3G to browse or read articles, there is no clear way you can save them for reading offline. The available options are to share on Facebook or Twitter or to email to yourself. It would be nice to be able to open the PDF of the article in iBooks (or whatever PDF reader one chooses to use) to save it for offline reading and reference. You are also given the option of adding an abstract to your reading list or to your library. However, when I tried to access these offline I was unable to access the library at all and the reading list only provided the abstract, not the full article (even though I had already opened and read the PDF). The default sort order in the headline view is date of publication. If you’d like to browse within a particular issue of a journal, this is fairly easy. You can click on your menu on the top right and select your journal of interest. When you go into an individual journal, you can click on the journal title at the top to see the table of contents arranged by date. Page numbers would probably also be useful to display here, but I still often see references to specific pages and like to double check. Once you click on an article, you will see an intermediary window where you are given options to add the article to your favorites, add it to your library for offline reading, or set up an alert to tell you when it is available for free. However, this is not perfect. Through no fault of the developers, information on when and where specific articles become free is often spotty and incorrect. Several of the articles I tried are currently available for free, but the journal as a whole is not. Coming back around to the topic search that I set up on medical education, it is very unclear why these articles come up in the search. I do get a lot of articles, but I am unclear why. 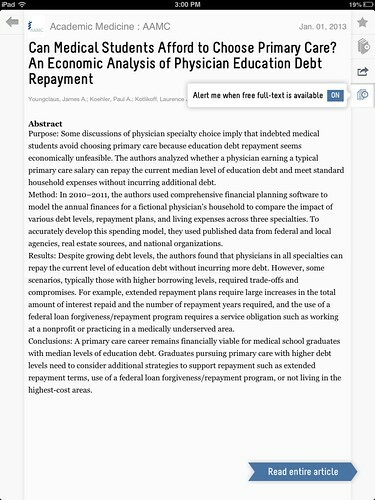 Not everything from Academic Medicine or Academic Emergency Medicine is included, and what is included only shows you the journal title in the Flipboard-type view, not in the table of contents view. This is a confusing feature that could be improved by a few tweaks, such as including the journal titles and page numbers in the table of contents view and specifying where and what you are searching. 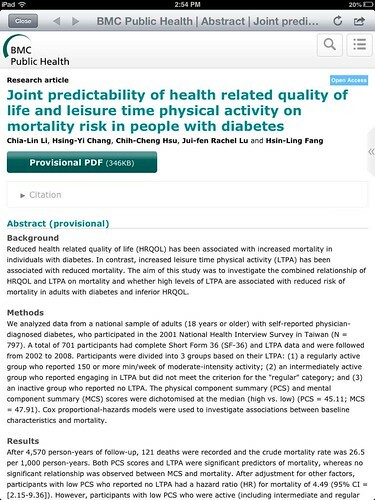 One confusing point is that depending on the journal, you are given a different look when you click to read the abstract. The caveat to this may not be immediately noticeable to any given physician. Articles that are in open access journals (BMC Public Health, PLoS One, etc) will link directly to that journal’s web site from the main view. This does not give you the option of adding an article to your reading list or saving it to your library. There is a work-around if you want to do those things. You can go into the individual journal’s table of contents, select the article from there, and then you are presented with the same view you will see for other articles. Unfortunately for many, there is no indication of which journals/articles are open access and which journals would be behind a pay wall. Users who do not have an affiliation that will pay for their access will have a more difficult time accessing articles and navigating which ones are freely available. 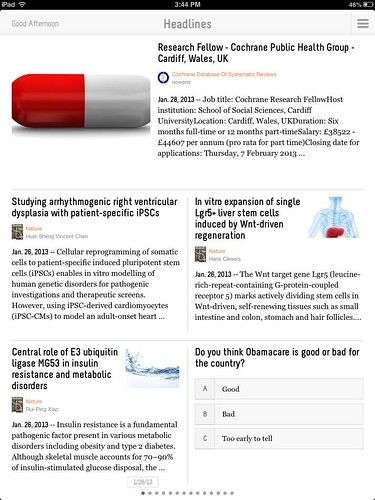 It does seem that most of the health and medical related news items are freely accessible. One potential improvement could be a “Specialty” area that includes any open access journals or free content, although I’m sure that would be burdensome and complicated to maintain accurately. Overall, I think the app has a very nice design and is easy to use. It integrates well with a variety of library remote login systems and is free to both users and libraries. It could definitely use a few improvements to enhance the quality and reliability of the features, but this will probably come in time. From my point of view, having news items included is one of the best features. I find that our users often read the popular media health care stories anyway, so it makes a lot of sense to include them in this app. This app will likely continue to improve as users suggest additional helpful and new features. Interesting review. I have just started using this application. I must admit that i do like the fact that ir aggregates news from non medical journal sources and this is a big plus. however i am not satisfied at many other fronts. Adding proxy settings again and again is cumbersome. the native broswer is completely lack lusture. there is no way to export files to a different reader as far as i can tell. There is no way to know how far along one has read through the list. I think Read by Qxmed is better in its interface. however i have heard that it will not be a free service in future. if the subscription is ok i would buy it. Just a few updates. 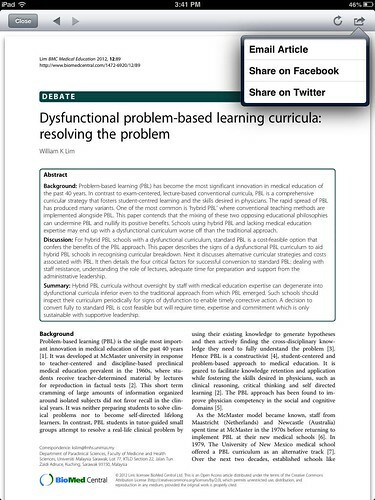 We now have an iPhone version, save proxy information for a user’s institution and integrate with Dropbox, Evernote and a number of other applications for saving PDF versions of the articles.